Well, now that I dusted off this situation let's see what else has been lingering in draft form. 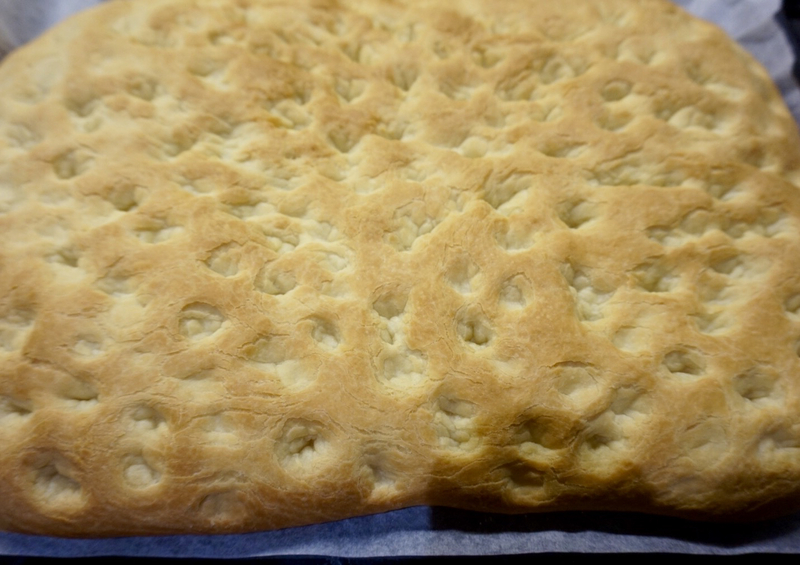 Here's a great tragedy, you could have been baking this ridiculously good focaccia for the last few years. But unless you also own the excellent cookbook from Flour in Boston, well, you have been missing this recipe for easy and amazing focaccia. We are here today to remedy the situation. Homemade focaccia should be started mid day for serving for dinner. It will take you about 20 minutes to make the dough followed by at least an hour and a half to rise and less than half an hour to bake. It can be on your table in just under 3 hours. So worth the small effort and short wait. You really need to be comfortable with olive oil as an ingredient. So much information out there about cooking oils. Oh, and flour, because you know this is bread so it is mainly flour. Clearly I am not afraid of either. Anyway, you use a half-cup of olive oil here which I guarantee is the reason this recipe is so good. Find yourself an olive oil that you really enjoy because it's flavor will be front and center here. Try some smaller producers. Maybe shop around where they let you taste test. Make a pilgrimage to Zingerman's in Ann Arbor where you can truly try anything. And you should. Trust me. Try all the foods. Go hungry. For my Australian friends, Harris Farm offers an olive oil from the Hunter Valley, Rosto, which is not too dear but is a workhorse in my kitchen. I usually buy the "mellow" variety. This is the same olive oil I use for my olive oil cake. Well, it's the same one I use to dip my fresh bread in, the one I toss in my pasta and the one I usually use for salads (we never ever have bottled salad dressing, it's just a thing for me). I stock up within reason when it is on sale, but it's not wine and does not benefit from resting, so keep that in mind. What I like about this recipe is the tender crumb. It's very soft when baked, but you can easily slice or tear it. You can even slice it horizontally to use for sandwiches or paninis. I love to make it and then serve it with a super easy warm dish of marinara/pasta sauce topped with rounds of goat cheese and maybe a few matching fresh herbs and baked until bubbly. It will last a couple of days at room temperature, but freeze or refrigerate it after that if by some strange occurrence it has not all been consumed. I made this batch mainly for photos for this blog and half of it is in the freezer because I could easily finish it off and no amount of ocean swimming and headland hikes can balance out an entire focaccia for one person. A note on the flour: I use all-purpose flour, but look for one with a fairly high protein content. Here in Australia, Healthy Baker all-purpose flour has about 10 grams of protein which is a similar protein profile to bread flour. The original recipe calls for 3 cups all-purpose flour and 1cup bread flour which I have used to good results in the states. But I just don't keep bread flour here. We battle things like small pantries and the dreaded pantry moths, so keeping all-purpose and whole-wheat flours is enough for me. (the little nuisance pests here are more worrisome than all the ones that can kill you, I know you've seen the Buzzfeeds about how everything in Australia will kill you. Maybe, but your more likely to be annoyed by the ones that are not lethal). Now, I do buy a lower protein flour if I'm baking fine layer cakes that do not need the structure high protein flours bring to bread recipes. In Australia, White Wings flours are generally low protein (around 3-4 grams). A little science for you. Also note: don't let me fool you into thinking our small pantry isn't really half-full of baking things, it totally is even without the bread flour. You can make this using a stand mixer, but I don't have mine (it is being well-loved in the kitchen of a dear friend while I am away) with me and have turned out lovely ones with just stirring and kneading by hand. Not hard. Just take off your rings (and please put them somewhere safe that you will remember where you put them, not saying this is a problem for me or you but....). 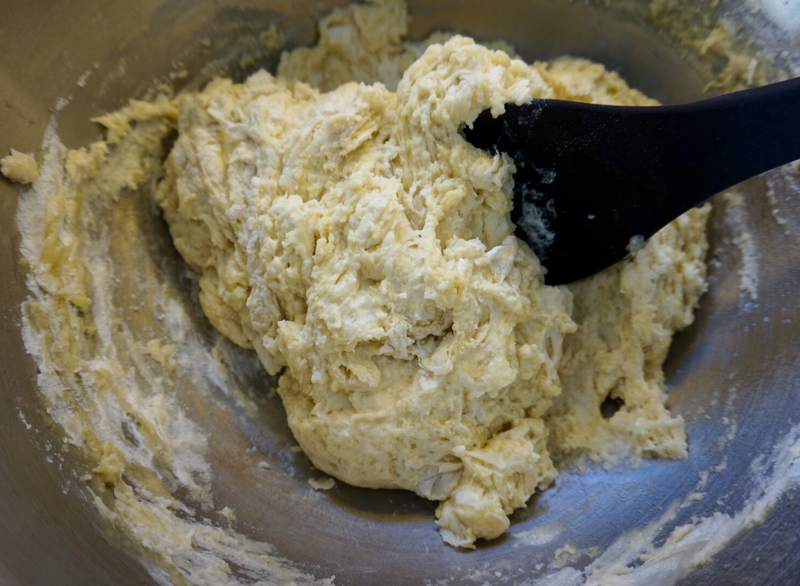 Depending on the weather (really, the heat and humidity have a whole lot to say about yeast breads), it takes about 5 minutes or less to knead the dough by hand in the bowl until it feels even and smooth and a little sticky. Give it a go. You'll make it all the time. Feel free to top it with herbs or cheese or knead some in if you like. I like it plain, but that's just me. Well, not really. I'm hardly plain. But this recipe is very nice in it's simple form. Measure 1 1/2 cups (360 ml) tepid water (very warm, just hot, not boiling) and stir in the yeast and 2 teaspoons of the sugar. Let rest for a couple of minutes until it starts to build bubbles and foam. If this does not happen, you may need fresher yeast or a little water temperature adjustment. In a large bowl, measure out the 3 cups of the flour, remaining 3 teaspoons sugar and salt. Stir or whisk to combine. Add in the bubbly water mixture and stir (or use that stand mixer) until mostly worked in and shaggy. Slowly add in olive oil and stir (or mix). 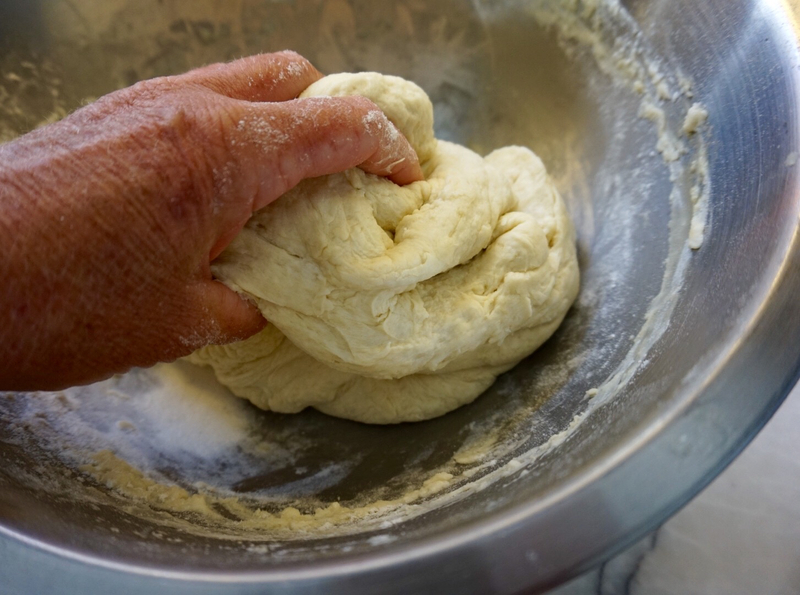 Don't worry, you will knead it all together. Add in maybe half of the remaining cup of flour and start kneading. 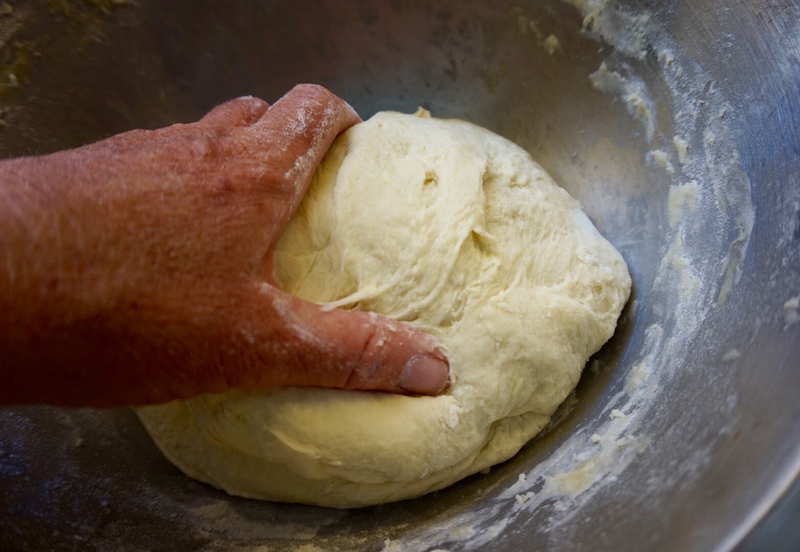 Just grab that dough and pull it around and push it down and do it again. 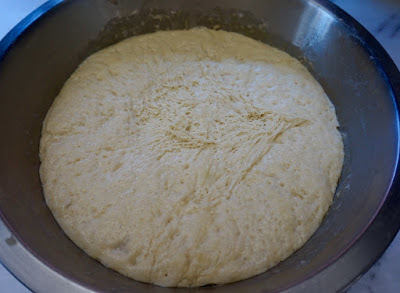 If the dough gets too sticky, add the remaining flour in a little at time. I like my dough just a little sticky, workable but not dry. I do not always use all of the flour (really depends on a lot of things like heat and humidity). This dough seems super forgiving. I don't think you can do it wrong. I usually work it around for 5 minutes give or take until it's smooth. 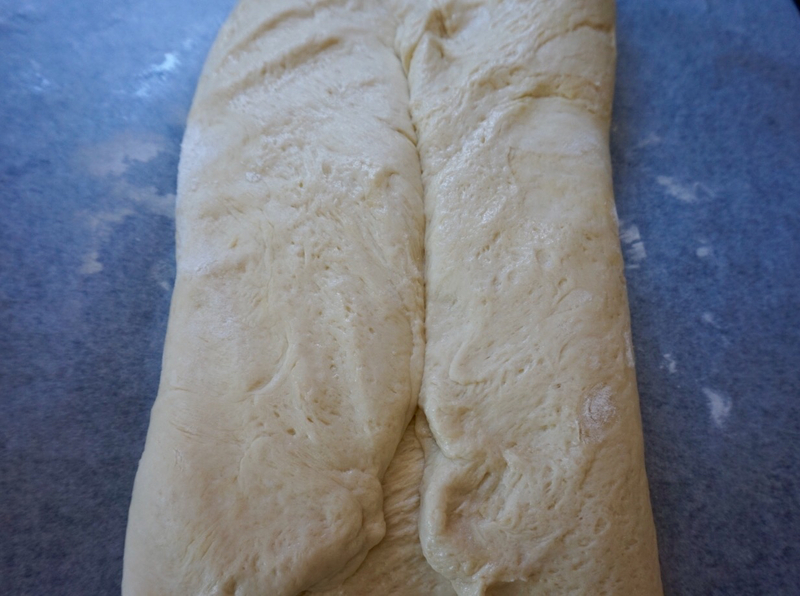 If you don't generally knead bread, keep going. Look at the dough and feel it. It really does smooth out as you go along. Lift up the ball of dough and pour a little olive oil on your hands and grease the side and bottom of the bowl a bit so the dough does not stick when it rises. 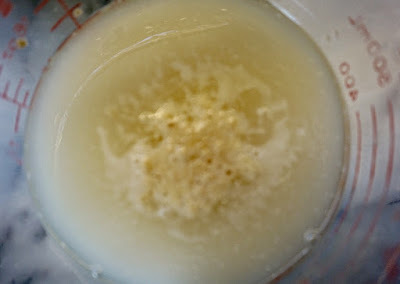 Place the dough ball in the oiled bowl. Cover the bowl with plastic wrap (not essential if you are opposed to single-use plastics and you should be, take it from someone who swims in the ocean every day) and/or a tea towel. 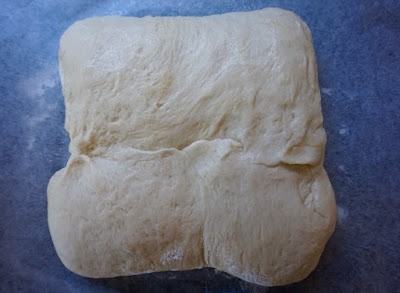 Place covered dough in a warm draft-free place to double in size (at least an hour and a half). Here's a little hint, our house herein be very cold with early spring and no heat (that's right, no heat and let me tell you how many times you wake up and think, turn up the thermostat, hahahahaha) so I usually turn the oven on to a low heat for just a couple of minutes (really maybe 3 minutes enough to take the chill off, don't get it hot so you cook the dough), turn off the heat and place the covered dough in the very slightly warm oven to rise. 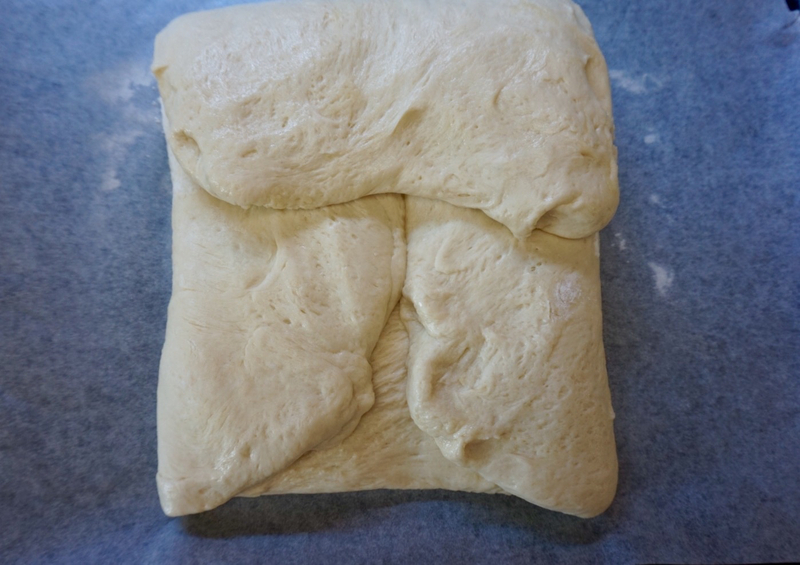 When the dough is doubled in size, uncover it and punch it down in the middle. Line a baking sheet with parchment/baking paper. Lightly sprinkle the paper with a little flour, fine corn meal or semolina (which, as far as I can tell is another name for fine corn meal). Lightly flour your hands to and press the dough into a rectangle about 8 x10 inches/20 x 25 cm. Fold the top edge down to the center of the square and bring up the bottom edge to meet in the center. Press and seal the seam a bit. Now fold in the left side to the center and the right side to meet it. Press the seam again. Flip the folded dough over and shape it into a big rectangle about 12 x 18 inches/ 30 x 45 cm or really however you would like it. Make it into an oval, a circle, two squares or whatever. 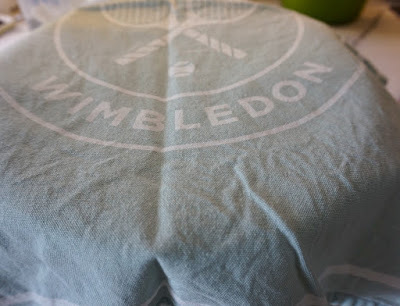 Let it rest and rise again covered loosely with plastic wrap and or a tea towel for about an hour. 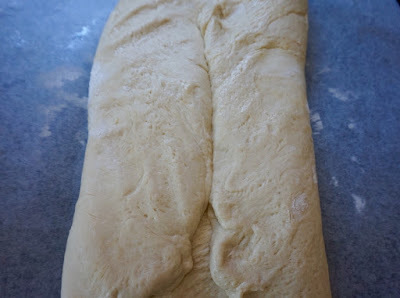 (Note: if you are in a hurry or have run out of time you can bake it now without a second rise). Preheat your oven to 400 F/ 200C. 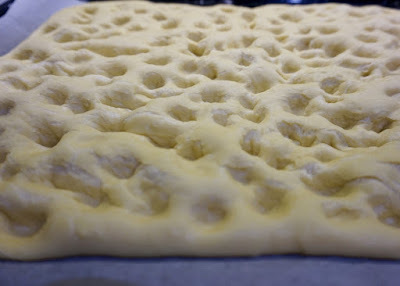 When the dough has risen nicely (it really will look like a pillow), use your ringers to press and poke the top of the dough for a pebbly texture. Bake for 30 min (up to 45, check it first around 25 min and if it's browning too fast on the top loosely cover it with foil) until the top and bottom are completely golden brown (it's easy to pick up a corner and check the bottom, just use a hot pad or something to protect your fingers). Cool on the pan on a wire rack for a bit before slicing. 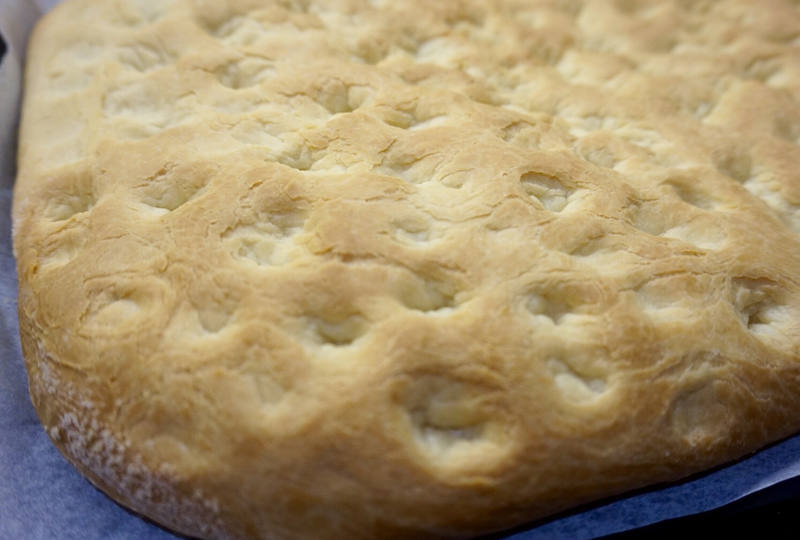 The focaccia will keep in a closed paper bag on your counter for 2-3 days or it can be tightly wrapped and frozen for a couple of weeks. It's good toasted to refresh it if you have leftovers.